Update: There is now a very detailed step-by-step lesson for making dashi here. It's highly recommended if you are a dashi making newbie. Dashi is the basic soup stock used in Japanese cooking. Unlike Western or Chinese basic stocks that rely on stewing meat or vegetables for a long time to extract the flavors, Japanese dashi can be quite quickly made. There are instant dashi granules available, but like instant stock cubes they are high in sodium and stuff. Not that sodium is necessarily bad, but when it's so easy to make a real stock from scratch, why go for the fake stuff? There are basic ingredients for making dashi, all of which can be bought at a Japanese grocery store. Korean or general Asian/Chinese grocery stores may have them too, though I have noticed that while instant dashi is readily available, the basic dashi ingredients aren't always. You may be able to buy bonito flakes and konbu seaweed at a Whole Food or very well stocked regular supermarket also these days too. Some natural food stores sell these ingredients sometimes. The first ingredient used for dashi is shaved dried bonito flakes, called katsuo bushi or kezuri bushi. You can also buy a whole, dried bonito (it looks like a fish-shaped wooden log) and shave it on something that looks like a plane, but this is too much work for me. I just use the preshaved bonito flakes that come in big bags. Dried kombu seaweed is the second ingredient. This is a leathery seaweed, that comes in large leaves. What I do is to cut up the leaves with scissors into approximately 4 inch lengths, pack them well in multiple layers of plastic bags and store them in the freezer. The third commonly used ngredient is dried sardines, called niboshi. This produces the most distinctively flavored stock. I rarely use niboshi myself, simply because it's rather hard to get a hold of good, non-rancid niboshi here where I live. If you have some niboshi, sniff it. If it smells strange, your stock will taste strange too. Cats love niboshi, either dried or after they've been used for stock. Following my mother's example, I usually make a dashi using bonito flakes and kombu. This is also called ichiban-dashi - first stock. Frugal housewives often make niban-dashi - second stock - by re-extracting more goodness out of the kombu and bonito flakes already used for ichiban-dashi. Niban-dashi is fine to use for stewed vegetables and the like. Soak the dried kombu seaweed piece in 3-4 cups of cold water for about 20 minutes. Bring the water to the boil, then add the handful of bonito flakes. Immediately switch off the heat and let it sit for at least 5 minutes. Strain through a sieve, pressing out all the goodness. When I'm pressed for time, I use the mizudashi method of making dashi. This is the method I've described for making vegetarian dashi, except that I add some bonito flakes. I put a piece of kombu seaweed and a big handful of bonito flakes in a jug of cold water, and let it steep for at least a few hours or overnight. To use the dashi I simply strain it out. The dashi keeps in the fridge for a few days, and if I don't use it up during that time (which is rare) I just freeze it. Aside from having to remember to fill up a jug, this method couldn't be easier. The two methods described above make ichiban dashi (first dashi), which is the strongest in flavor. This is used for dishes where the dashi flavor is paramount, such as soups or dipping sauces. But for stews and other dishes where dashi is more of a background component, a frugal cook uses niban dashi (second dashi). Since kombu and bonito flakes are so expensive outside of Japan, it really pays for those of us who live 'over the sea' to make niban dashi! To make this, simply re-simmer the kombu and bonito flakes you used for making ichiban dashi for a while; this extracts a light flavored dashi. I freeze the kombu-bonito flakes clumps and use a couple of them at a time to make niban dashi. Submitted by maki on 2003-11-29 13:48. Wow! All maki-san's recipes are really easily explained! I'm only fifteen years old really, and I really like Japanese food! Now I can make some at home and make my mom think about what a really capable girl I am! lol. Thank you for posting these recipes up! Hello .. not sure how to use this forum ... My question is about the 4" piece of Konbu seaweed for Ichiban-Dashi, 4" by what " .. I have a typical sheet so is it 4" wide by the length of the sheet? I imagine just 4" by 4". The description does talk about cutting the Konbu up into 4" pieces so if it is already 4" wide, then just cut along every 4" lengthways. I have frozen dashi before and it thaws beautifully. Just make sure you're freezing the stock in the quantity you will later need. I've run across problems when I freeze the whole batch in one container. It's harder to measure out and thaw just part. Using ice cube trays would be a good way. Another is to use quart sized freezer bags with 1 or 2 cups of stock in them. Is it possible to freeze bonito flakes? You can store bonito flakes in the freezer, but they don't need to be since they are a dried product. They will keep their flavor a bit longer in the freezer, but do be careful that they don't take on 'freezer flavor' by wrapping them up very well. Thank you for the reply, sensei! So they will last okay for a couple of months in the fridge if stored in a tight container? Sure...though again, in the fridge I would be wary of 'refrigerator odor' getting absorbed by the bonito flakes. Make sure it's wrapped up air tight! It will also last fine in your pantry at room temperature for a couple of months. Japanese households usually keep it outside of refrigeration. An opened bag should be used up asap for maximum flavor. Thinking off the top of my head, the best way to keep bonito flakes for the longest period would probably be to vacuum pack it with one of those vacuum-bag gadgets, whatever temperature you decide to keep it at. "It’s harder to measure out and thaw just part." You weigh it. A cup of ice (frozen dashi) weighs 8 oz. A liter weighs a kilogram. Hey, I have a question. I was trying to make shiitake dashi, but it didn't turn out too well. Do you have any tips on shiitake dashi or any other way of making a vegetarian dashi? Any help would be appreciated. Arigatou. Nilld, the best way to make a shiitake dashi is to simply soak some dried shiitake in water for a few hours. The resulting soaking liquid has tons of flavor - much more than anything you can produce from fresh shiitake. Thanks, maki. I guess I just didn't soak the shiitake long enough last time I tried to make it then. That really helped. i have a question, i have some dashi granuals i bought at the local japanese store. when i make the recipe acording to the package directions (1tsp per 3 cups water) there is hardly any flavor. just how strong should the flavor of the stock be to be authentic? i make 3 or 4 times stronger then they suggest and it tastes fine-salty and fishy. CW, it really depends on what you are using the dashi for. For instance, if you are using it as the stock for a miso soup, you don't really need much because the miso and so on will add more flavor. If you are using it on its own for a clear soup you'd need more, and so on. It really depends on you and what tastes good to you! The granules are just like Western/European style soup granules/cubes (Knorr, OXO etc). The advantage of instant soup/dashi granules is that they are very convenient...the disadvantage is that they have a lot of salt (and often MSG and things). i live on the west coast of Canada and have lots of fresh fish at my disposal. Can i use fresh fish instead of Bonito flakes to make my stock? Is there a fish that would resemble bonito flavor? Some time ago I made a fish quenelle soup, which is similar to fish-ball soups you can get in Japan especially in fishing areas. That kind of soup is usually made with a simple kombu dashi. A friend of mine tried to make dashi stock recently, to use in miso, but she said when she began to work with the bonito flakes, it filled her apartment with an awful smell that seemed to have a life of its own, and "haunted the whole place for days". Is there a particular brand of bonito I should be looking for to avoid this, or do I need to worry about the flakes being fresh? I'm dying to try and make my own sushi, but her experience with bonito has made me nervous about trying. You can also try dashi granules (e.g. Hondashi) instead - they are quite ok for flavoring sushi rice if MSG does not bother you. Or, just try using konbu alone (put a piece in the rice cooker with the water and rice). I just got back from spending the summer in Japan and this site is making me very hungry!! Another quick question about making vegetarian dashi (i eat fish in japan since it's almost impossible not to, but not in the US). If I am making a shiitake-based dashi, should I still add the kombu?? Or is it better with just the shiitake alone? Thanks for any info - I am anxious to try making the kitsune udon! You can just use shiitake if you like, or add the kombu too. Kombu has a lot of umami, which is what you want in a dashi, but so does shiitake. It's up to you! Sorry if you covered this somewhere else in your site, but is there a good substitute for dashi stock if you're allergic to fish? i have to make something Japanese for my International Dinner at my school tonight so I was so excited when I found the recipe for toshikoshi soba but when i went to the international store yesterday they didn't have ANYTHING you called for in the dashi. Do you have any suggestions on some kind of substitute or any advice on what I should do? Thanks! And I LOVE yours site!! I just got back from the Asian supermarket in my town. I was going to get some premade dashi, but when I looked at the ingredients, the first one was salt, and the other was MSG! What?? Anyway, your recipe is so easy, I think I'll just go back and get some kombu and make my own. Then I can have dashimaki tamago for lunch tomorrow. :) LOVE your site! it is impossible to get konbu seaweed here in Russia. Pls advise if it is possible to use nori seaweed? what other seaweed substitutes can be used for dashi stock? many many thanks! ...but of course i do have bonito! Anna, nori wouldn't be very good - it would just disintegrate in the water. Besides, it's not cheap either. If you have bonito I'd just use that on its own (though you need quite a lot of it, like a huge handful for 2-3 cups of stock)...or just use dashi stock granules. I had miso soup the other day and loved it. So simple, yet so flavorful. I had to try making my own. I picked up wakame seaweed -is this ok to use in place of kombu? The seaweed looks so awesome after it's re-hydrated. I was wondering also if the left-over seaweed from making dashi could be used in other dishes. The recipe for "Takoyaki with a great video" on your site has kombu dashi stock granules and katsuo dashi stock granules in the batter recipe. I have kombu and katsuo and I also have dashi stock granules for making dashi stock, but I am wondering if I can substitute this for the kombu dashi stock granules and katsuo dashi stock granules? If not, how do I make these two stocks? Do I have to purchase these two granules separately? You can just use the dashi stock granules you have. I guess the flavor might be a bit more complex with the 2 kinds of dashi, but the difference will be quite subtle. Hey Maki. I was wondering, does the cold water method lose any flavor? And can you freeze both the heated and cold water methods? Thanks! No (if anything I think it retains more flavor) and yes you can freeze either. If you keep it well sealed, dry and away from light, it keeps quite a long time, though you should try to use it up within a year or so before it loses its flavor and turns into fishy wood shavings. 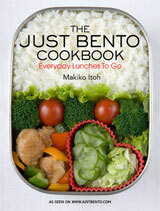 Maki, I would just like to say thank you for sharing all these recipes with us. It's a lot of help and you make the directions so easy to follow. I do have one quick question, the area that I live in doesn't have much in the ways of Japanese groceries. Do you have any suggestions for online stores to shop from? Do you have chawanmushi recipe? i love to eat chawanmushi so thinking of making it. Thanks for posting these great recipes. I made soba last night and wanted a dashi stock soup with it. I did have the konbu, but I found that we had dulse (which is a north atlantic "sea vegetable") in our pantry. I todded in a chunk of that with the bonito flakes. It was great. The sea vegetable broke up into smallish pieces, so I just left it in as part of the soup with the soba. Also I reserved the boiling water from the soba and used that instead of tap water. It added a bit of color, flavor and nutrients to the dashi. Plus it was already hot so it cut the cooking time down. I think Japanese cooking is starting to take the place of Italian food in my diet (probably the best thing for my waistline) and your blogs are really an inspiration. Hi, thank you for the recipe, but I just need one clarification. I was wondering if you had any ideas/recipes what to do with the left over kombu and katsuobushi after making dashi? After I make the dashi stock, I have been just feeding the kombu and katsuobushi to my dogs. You can freeze them, and then use a few batches to make _nibandashi_ (2nd dashi), which is fine for using in stewed dishes and such. You can also cook it in some water, sugar, mirin or sake and soy sauce until the konbu is soft (maybe with some additional katsuobushi) - like shio kombu. This is good as an onigiri filling! I went to the Asian Market and looked through all of the Seaweed options and could not find Kombu. Is there another name for it or what should I look for? What does it look like? Excellent site by the way, I really enjoy it! See the first section of this page - look for konbu/kombu at a Japanese grocery store rather than a general Asian one. You can order it by mailorder too. Great site with so much good info! Hi, we just made some dashi and udon for the first time using your instructions. it was great thank you! How long will the dashi keep for in the fridge? How do I adjust this recipe for fresh kombu? Or should I dry the fresh stuff before using it, and if so, how do you recommend I do it? Re: Japanese basics: dashi stock---fish heads? Hello and thank you for the helpful website. My mother in law makes dashi that begins with fish heads and tails and that sort of thing. Do you have a recipe that begins with the fish rather than with kombu or bonito flakes? Were can I purchase dashi? Hi! Thanks so much for posting this up. Quick question - how do you store your dashi ingredients, including niboshi? I tried researching this online but some people say in the fridge whereas others say in an airtight container in the pantry. I have been making my own dashi for about a year now using flakes and kombu and love it for Japanese cooking. The problem I have is that I live where I can not reliably get fresh fish, especially not heads and bones and I am looking for a substitute for home made fish stock for western style dishes. I was wondering if you have utilized dashi in place of a western style fish stock for sauces and what if anything needs to be changed for this use? Just off the top of my head, I would try adding plenty of aromatic vegetables that are 'western' flavored, to the bonito flakes etc. Fennel, celery, dill, parsley, thyme all taste very French/European to me. You'll also want onion and so on, and leave out the ginger (ginger tastes more Asian to me). I know you mention making second dashi, but how do you properly store the preused kombu for use in second dashi or do you make second dashi right after the first dashi? Hi, I can not find bonito flakes in my city and everyone I ask has no clue what I am talking about. I don't live close to any major lakes or rivers at all and some Japanese ingredients are hard to find here. I did find small whole dried fish that I think is sardines but I am not sure if I should be using them for this kind of stock. Do you think that these would work as a substitute and should I cut the fish up into small pieces before using? Thanks. sorry do you mean a 4 inch piece (which is about 10cm) of konbu or a 4cm piece (which is about 1-2inches)? P.S. love the blog! am making cold soba dipping sauce from this right now! Hi,Maki.I stumbled upon your blog this morning and spent 3 hrs non-stop to read and make notes. Here's my recipe for recovery and healing. Do you know a good store to purchase the dried bonito flakes? Thats the only ingriedent left on my list. Check out the Japanese grocery store list for your area, or if you are in the U.S. try Amazon Groceries. If you have a large Whole Foods near you they may carry it too. In the cold water method do you let it steep in the fridge or room temperature? If the weather is warm (or the room is overheated...rare around here!) I put it in the refrigerator, where I store it anyway if there are leftovers. I was wondering if you use less water for the cold water method or about the same 3-4 cups worth that is in your original recipe. I tried the cold water method, and maybe I just used too little bonito, but my "stock" was clear and had very little taste to it after 24 hours. I added more bonito and kombu, and will let it sit up to another 24 hours. Hopefully I was just too stingy with my ingredients! Hi Nokko, I do add more bonito flakes when I use the cold water method, so perhaps it's less frugal than the regular method - but more convenient for sure as long as you remember to always have a jugful going in the fridge. I've been following your blog for a long time, but now I have a baby boy! My question is: can you use dashi on homemade baby food? In fact, if you can have a post about homemade Japanese baby food, that'll be awesome! I know your sister (?) in Japan has a toddler but maybe you can share with us what she did when her child was a baby. Most of baby food in U.S. are fruits puree which are sweet, I'd like to expose my son to more varied tastes, esp umami (Natto?). Thank you! I found your wonderful site and read about the alternatives to bonito flakes for making dashi. Of course my local Korean store was out of bonito flakes, so I decided to use shrimp skins & tails to extract some seafood flavors for a dashi, along with kombu I already had. I was already planning to put tiny shrimp pieces in the soup, along with spring onion, carrot slivers, and a few spinach pieces. There was a lot of flavor to be extracted from the shrimp skins and tails with tiny bits of shrimp meat left on them. It was very delicious and there was no soup left to be saved after the party. One recipe called for dried katsuobushi instead of bonito. What's the difference and would it still work? Thanks for the help! I want to make some Japanese soups with a dashi base that include noodles (like udon). Should I cook the noodles in the dashi, or cook them in a separate pot and then add the cooked noodles to the dashi? You should never cook the noodles in the soup. You may find this article useful: http://www.justhungry.com/basics-cold-soba-noodles-dipping-sauce The procedure is basically the same for all Japanese noodles - udon, somen, soba, etc. The only difference is the concentration of the soup; for hot noodles, it's more diluted than with cold noodles where you use the soup/sauce for dipping. Excuse me, I hope you don't mind if I ask a question. I've looked for an answer, but could only find vague mentions of it. Could dashi stock be made in a slow cooker? If so how long and how hot should it be? I would like to be able to make the stock, add ingredients to make soup throughout the day. Like I would make the stock and then add some green onions to make soup in the morning and for lunch. Then, I'll had mushrooms and other ingredients to make the miso soup I want to have for supper and let it cook. I would not add the miso at all, of course! I would just pour the soup I want into a bowl and add the amount of miso I want to that, leaving the rest of the soup in the slow cooker for use later. So is this idea doable? Thank you! Yes, I know that this is a VERY old post. It as a big help to me in chasing down the ingredients for a copy-cat edition of the Gyudon that I'm cray about. I don't really want to make my own broth here, but it seems like a simple procedure - IF... IF I can find the two principal ingredients. (I have penty of very good water, thanks!) I appreciate your post. -C.
Your site is wonderful! Thank you very much for sharing all this. I bought the kombi and the bonito an have this silly question. You wrote that we need a piece of 4 inches of kombi, about 3 to 4 cm. The thing is that 1 inch is 2.5 cm, so 4 inches will be 10 cm. So the little typo is on the cm right? How many calories in one cup of dashi? I've tried your basic dashi recipe but now I intend to make some ichiban-dashi by using niboshi. Other than replacing the bonito flakes with niboshi, can I follow the same steps as I prepare the inchiban-dashi (hot-water method)? I live in Canada and have been waiting to make Miso Soup but I am having the hardest time finding Bonito Flakes. No where I go and no one i ask seems to know where I can get Bonito Flakes. I cant order them online because I dont want to pay ridiculous shipping and handling fees or expedited fees for food products. Is there another 'dried' fish alternative or some other 'dried' meat or smoked meat alternative that I can use to mimic the Bonito Flakes' flavour? You don't say where in Canada you are, but have you looked at the list of Japanese and Asian groceries? 'Trendy' supermarkets like Whole Foods carry them now in the U.S. so perhaps similar supermarkets will carry them in Canada also. I'm afraid there really isn't a good dried substitute for bonito flakes. You can try simmering fish bones and fish heads to make a fish stock, but it won't be the same (and will be a lot more work too). Once i tried to made Dashi(basic Japanese sea stock) without Dashi granules included.But that was not said to good perfectly whatever i had been providing their, I want to share with you and just make it correct if any missing in an ingredients. I make dashi overnight in the slow cooker. It works! It might make it a little strong, but it can be thinned with a little water. Just put a quart or so of water in the crockpot. add a piece of kombu and a handful of bonito flakes. In the morning, you'll have dashi and a stinky kitchen. I am out of Kombu. I have some dulse, can I use that instead?